Complex Regional Pain Syndrome (CRPS) is divided into two categories, CRPS I and CRPS II. CRPS I (caused by an injury to tissues) was previously called Reflex Sympathetic Dystrophy (RSD), Sudeck’s atrophy, and shoulder-hand syndrome. CRPS II (caused by damage to a nerve) was previously called causalgia. The symptoms and treatments of the two types are almost identical. For the purpose of this document we will refer to them jointly as CRPS. Early recognition of the signs and symptoms of CRPS as well as early treatment are usually effective in preventing it from becoming a chronic condition. When the condition becomes chronic, significant irreversible disability can occur. The sympathetic nervous system consists of ganglia, nerves and plexuses (a braid of nerves) that supply the involuntary muscles. Most of the nerves are motor, but some are sensory. 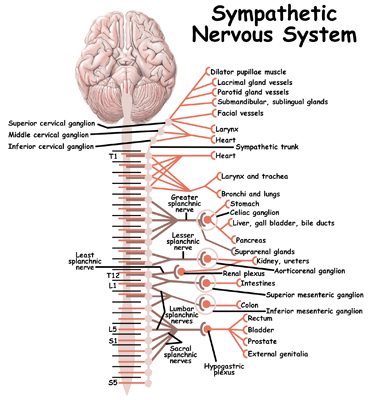 Sympathetic nerves are responsible for conducting sensation signals to the spinal cord from the body. They also regulate blood vessels and sweat glands. Sympathetic ganglia are collections of these nerves near the spinal cord. They contain approximately 20,000-30,000 nerve cell bodies. CRPS is felt to occur as the result of stimulation of sensory nerve fibers. 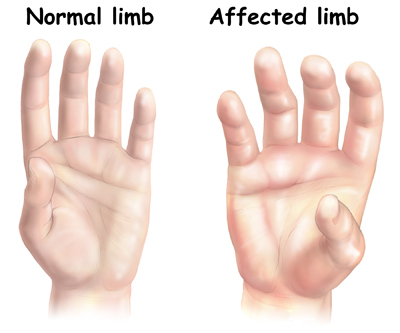 Those regions of the body rich in nerve endings such as the fingers, hands, wrist, and ankles are most commonly affected. When a nerve is excited, its endings release chemicals. These chemicals cause vasodilation (opening of the blood vessels). This allows fluid to leak from the blood vessel into the surrounding tissue. The result is inflammation or swelling leading to more stimulation of the sensory nerve fibers. This lowers the pain threshold. This entire process is called neurogenic inflammation. This explains the swelling, redness, and warmth of the skin in the involved area initially. It also explains the increased sensitivity to pain. As the symptoms go untreated, the affected area can become cool, have hair loss, and have brittle or cracked nails. Muscle atrophy or shrinkage, loss of bone density (calcium), contracture, swelling, and limited range of motion in joints can also occur in the affected limb. These are in part caused by decreased blood supply to the affected tissues as the condition progresses. CRPS commonly occurs after an injury as minor as having blood drawn, or a sprained ankle. 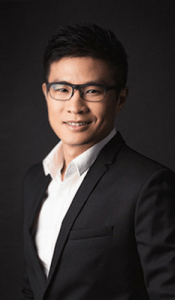 Other times, it may be the result of a more significant injury such as surgery, a fracture, immobilization with casting or splinting, or the result of a stroke. Risk factors for developing CRPS include immobilization of the affected limb with a cast, splint or sling; smoking; genetics; and psychological factors. 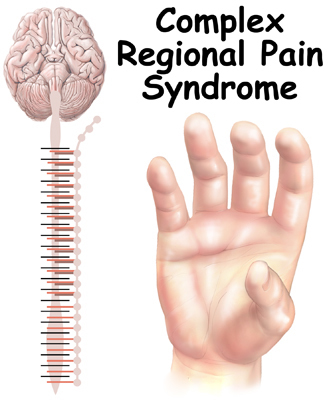 Complex regional pain syndrome more commonly affects the hand or foot, but may spread further up the affected limb and even into the opposite limb. The common symptoms of CRPS are unrelenting burning or aching pain, skin sensitivity, swelling, discoloration, sweating, and temperature changes. If the condition becomes chronic, dystrophy or deterioration of the bones and muscles in the affected body part may occur. The course of CRPS is commonly divided into 3 stages. In the acute or first stage the affected region is painful, tender, swollen, and warm. Also, sweating, discoloration (usually red), and an increase in hair and nail growth is evident. 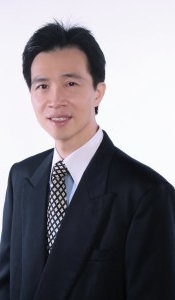 The second stage is characterized by burning pain, allodynia, hyperalgesia, coolness of the skin, hair loss, changes in skin such as paleness, and brittle or cracked nails. Allodynia is when pain is felt from stimulation which is not usually painful, such as light touch or a breeze. Experiencing pain from the sheet over an affected foot or leg is an example. Hyperalgesia is an increased, prolonged pain response. This is from something that would typically result in only mild discomfort. The third stage is permanent and is characterized by dystrophy or defective growth of bones or tissue. It consists of muscle atrophy or shrinkage, bone density (calcium) loss, contracture, edema, and limited range of motion of the affected joints. Pain is worsened by any kind of touch and movement of the affected limb. Sometimes only two stages are used to describe this condition. Temperature of the skin is either warm (stage 1), or cold (stage 2). The diagnosis of CRPS begins with a thorough history and physical examination. 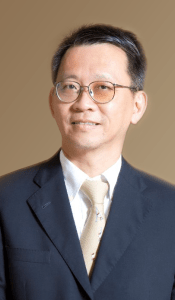 Conditions that may mimic CRPS should be ruled out and the proper treatment provided. Your doctor will ask questions about possible trauma or a period of immobilization that may have caused your symptoms. Your physical examination may include a skin examination to evaluate for swelling or a change in skin blood flow. Assessing temperature, color, sweating, hair and nail growth, range of motion, reflexes, and sensation testing may be included. Your doctor may also ask for one or more of the following tests. A local anesthetic is injected into the stellate ganglia in the neck when treating the upper extremity. The stellate ganglia are a group of interconnected nerve cell bodies. Injecting anesthetic into the low back is used to treat the lower extremity. The injected anesthetic should numb the affected limb. Pain relief and improved temperature of the extremity is a positive diagnostic test. Thermal imaging may be used which gives an infrared mapping of the skin temperature. A device called a laser doppler flow meter can also be used to measure skin blood flow. X-rays show problems with bone demineralization or loss of calcium from the bone. These changes can develop as the condition progresses. A bone scan is a special test where radioactive tracers are injected into your blood stream. The tracers then show up on special X-rays of the affected limb. In the CRPS affected limb, the uptake will be greater around the joints. Early on in the condition, the bone scan may be normal. Your doctor may request that you have a magnetic resonance imaging (MRI) of your spine or other part of your body. This test can show nerve compression either at the spine or of one of the larger nerves in your body that could be causing the pain. If nerve compression is found, then it is treated. Your doctor may request that you have blood drawn. Doctors use blood tests to identify other conditions such as arthritis or infection. Your doctor may request that you undergo an electromyogram (EMG) to help determine the source of your pain. If compression of nerves is found, then referral to a surgeon to release the pressure may be necessary. An EMG is a special test using needles and electricity that is used to determine if there are problems with any of the nerves going to the limb. It may also be used to assess atrophy of the muscles of the affected limb when CRPS is present. Early intervention is important for long-term positive outcomes. Most of the time CRPS will go away if the condition is recognized and treated early. Treatment may involve a multidisciplinary approach. Nerve blocks, drug therapy, physical therapy, behavioral therapy, and psychologic support may be included. Sympathetic ganglion blocks used to diagnose the condition are also used to help treat CRPS. This treatment option is usually considered in the early stages. It can be performed several times. The stellate ganglia, located near the base of the neck, are injected with numbing medication in order to make the diagnosis of CRPS and to help treat the condition. This is where nerve blocks are done when CRPS involves the arm or hand. The lumbar ganglia are injected to diagnose and treat symptoms of CRPS in the leg or foot. You may see a physical therapist during this period of time when the pain is decreased. Exercises and activities will focus on restoring motion, strength, and function. A regional sympathetic block involving the entire limb may be considered. An IV is used to administer a local anesthetic in the affected limb. A tourniquet is used to keep the medication from spreading to the body. Medications used for CRPS include anti-inflammatories. Sometimes steroids, very potent anti-inflammatories are used. Antidepressants can be beneficial as they help block the nerve pain whether you are depressed or not. Medications that prevent or stop seizures are often used. Other medications that dilate (open) blood vessels may be helpful. Topical creams can be used that contain an anesthetic such as lidocaine or other medications. Additionally, medications to prevent or halt the loss of calcium from the bones in the affected area may be considered. For the best results, two or more medications may be needed. Psychological support may be useful. Decreased self-esteem from decreased activity tolerance can occur. Anxiety and depression as a result of pain is also common. Relaxation and biofeedback are commonly used. In cases of chronic CRPS that has failed all other therapies, spinal cord stimulation is used with some success. 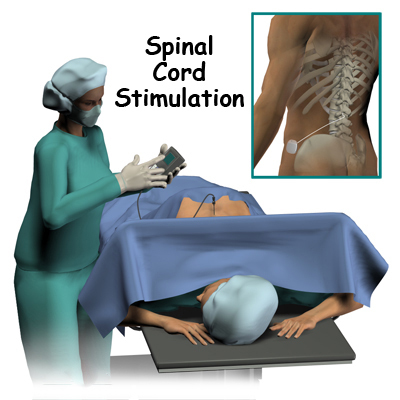 It involves the implanting of wires placed near the spinal cord that are attached to an electrical device. This helps to ‘short-circuit’ the pain pathway to the brain. If sympathetic blocks were temporarily beneficial but painful symptoms have become chronic and can’t be changed or reduced, then a more permanent solution may be needed. Sympathetic ganglia can be permanently treated. 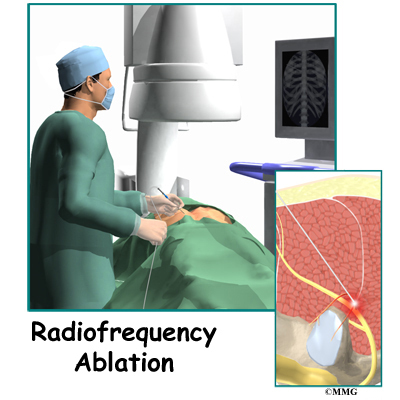 Destruction of the sympathetic ganglion either surgically (radiofrequency ablation), or chemically may be considered. In the extreme and rare case, amputation of the affected limb may be a surgical option. Physical therapy should be started as early as possible. Since pain from CRPS is made worse with movement, there is a tendency to protect the limb by holding it stiff. This lack of motion can lead to muscle atrophy (shrinkage) and stiff or frozen joints. Early movement of the joints involved is important. Physical therapy may also include alternating hot and cold soaks and massage to the affected region to help control inflammation. Weight bearing activities to prevent bone density (calcium) loss are also important. The therapist may start you on a desensitization program. You will begin by applying various textures and touch to the painful area. For example, you may start by rubbing the affected area with a soft hairbrush or washcloth. This can help desensitize the area and decrease pain. More stimulation is gradually added by rubbing or tapping with various textures and pressures. Although it may be quite painful, physical therapy is very important. The goal is to prevent the condition from progressing into chronic pain, disability, and deformity. Immobilization of the limb is discouraged unless necessary in the case of fracture. You may be asked to wear a compression stocking or glove to assist with management of swelling. You will likely be asked to resume or continue physical therapy following surgical interventions. Limited activity is allowed the first few days following placement of a spinal cord stimulator or destruction of the sympathetic ganglion. Maintaining range of motion and weight bearing activities is encouraged. These exercises are crucial to preventing permanent disability due to joint deformity, contracture, and bone density loss.